It's the last day of LEGO Week over at Toddler Approved! If you've missed our other LEGO ideas, we shared a DIY Removable LEGO Wall and a LEGO Camping Lantern on previous days. We also shared our ULTIMATE PVC Play Table in a Bag which would be great to use with LEGO! Today I'm sharing a super simple kid-made LEGO T-shirt that would be perfect for any LEGO Lover to wear to a LEGO Birthday party! Woe- that's a LOT of LEGO! 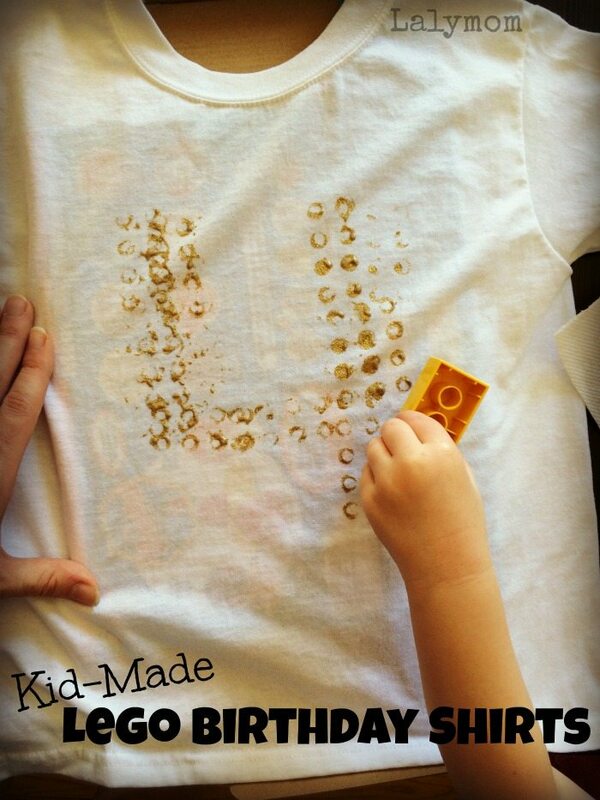 I like this shirt because it is fun and easy and kids love to play around with paint! I could see this being made in advance for your birthday boy or girl to wear, but it could also be a cool favor to hand out or an activity to do at the party. We made one for a friend turning three and one for my daughter who recently turned 4. In fact…you might guess based on the paint color that this was my daughter's GOLDEN birthday…ooooo fancy! We paired this Golden #4 shirt with a simple golden no sew tulle tutu. It's pretty much as easy as it looks but I'll lay it out for you just for good measure. 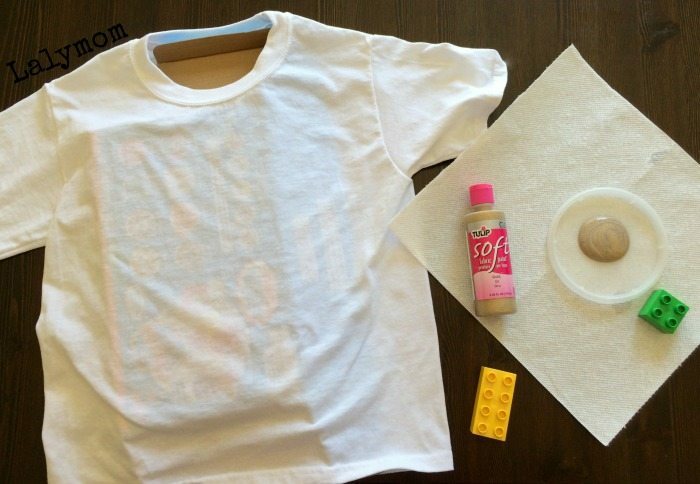 Insert the cardboard box into the shirt with the side that you want to stamp on facing up. This protects the back of the shirt from getting paint on it if it seeps through. 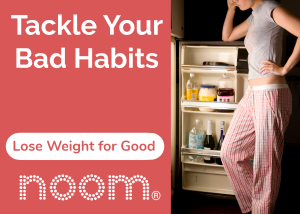 Use clothes pins to hold the shirt in place if desired. Squirt fabric paint onto your plastic lid, you or your child press your brick, hole side down, into the paint. You might try a couple practice stamps on paper or paper towel to see how much paint you need. 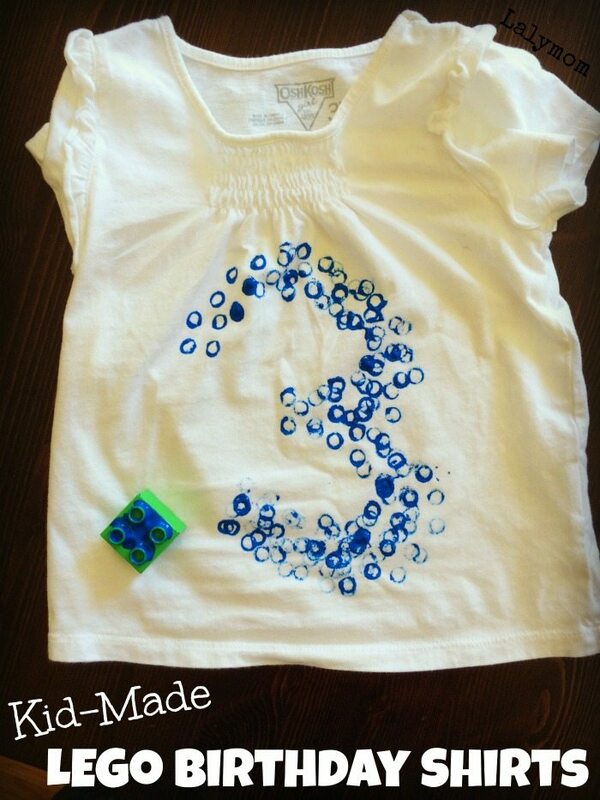 Then you or your child can stamp the paint onto the shirt to form the number you want- or any design you want! We chose to stick with one color per shirt but you could easily do more than one. Lay your shirt aside to dry according to your fabric paint label. That's it! Now you have a super cool LEGO T-shirt! 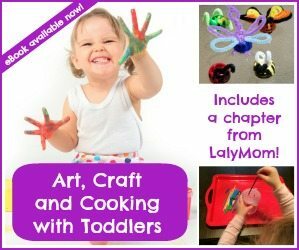 Want more LEGO party ideas, activities and building projects? Check out my LEGO and DUPLO Pinterest board! 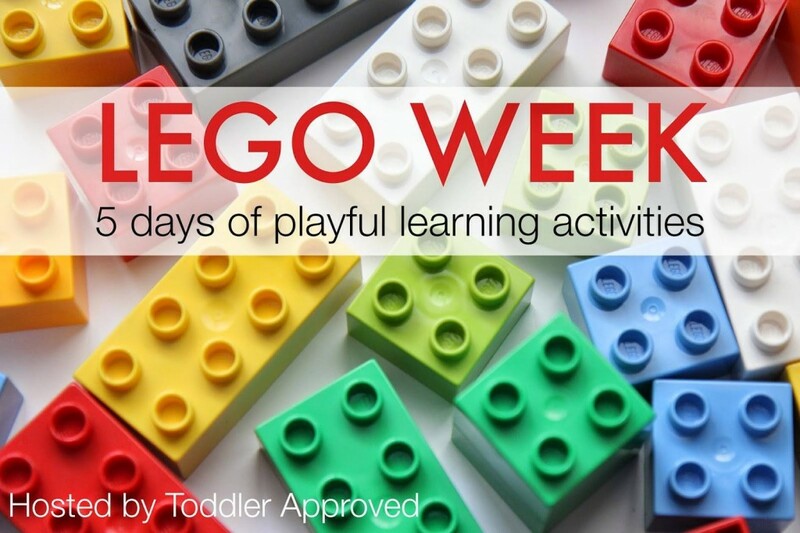 This is part of a week long celebration of all things LEGO over at Toddler Approved. She and a group of us bloggers will be sharing LEGO ideas on our blogs and Facebook Pages all week long! Are you a big LEGO fan? Have you made your own LEGO shirt before? What are your favorite LEGO Activities? Let's hear about it in the comments below!